And I’m back! Time for another edition of What’s Making Me Happy This Week. It’s been a good one, so here we go! I don’t have gestational diabetes! After getting the news that I failed my 1-hour glucose test, I was feeling pretty low. First of all, it meant I’d have to take the dreaded 3-hour glucose test (fast after midnight, arrive at your doctor’s office, get a blood draw, then drink a bottle of glucose syrup in under 5 minutes, then get your blood drawn every hour for 3 hours). It also meant I might actually have gestational diabetes, which would mean cutting out basically all my favorite pregnant lady foods (milkshakes, cookies, doughnuts, and all manner of carbs). The test itself was both easier than I thought (I was so hungry/thirsty from the fast that I downed that bottle of fruit punch syrup no problem) and worse (because I was dehydrated from the fast, my veins were not super cooperative and it took 6 needle sticks and some digging around to get 4 blood draws). But today I got the news that I passed! And celebrated with a trip to Dunkin’ Doughnuts. During my three hours of sitting in my midwife’s office, I burned through Sarah Dessen’s newest book. Getting that galley felt like finding a unicorn, and reading it definitely didn’t disappoint. 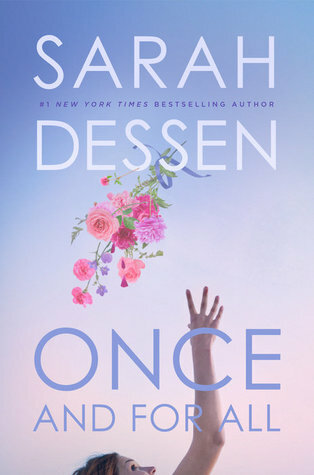 I think Once and for All joins Along for the Ride and The Truth About Forever on my list of favorite Dessen books. I just loved Ambrose and all the wedding planning stuff, and a plot point I won’t spoil for you because the way it unfolds is just beautiful and wonderful and heartbreaking. If you haven’t preordered it yet, GET ON IT ALREADY! I told myself I was going to take some time off between turning in the revision on book 5 and starting book 6. But then I was struck with a shiny new idea, and it just kept itching at my brain. I haven’t actually sat down at the computer yet, but I’ve been outlining and drafting scenes in a notebook. I love those heady early days of a new idea. It reminds me of the excitement and optimism when you start dating someone new, and I hope I can ride this for as long as possible (and maybe even get some semblance of a draft before this baby comes?). Before I go, remember how last week I told you I fell down a LuLaRoe rabbit hole? Because yeah, I was tuning into a couple live Facebook sales while fiddling with this shiny new idea and ended up winning two pairs of leggings and also scoring an Azure skirt on big time sale. Anyway, I decided to bite the bullet and host a one-time online pop-up with awesome fellow YA author Jessica Love on April 10th! So if you’re at all interested in checking out LuLaRoe, comment below, and I’ll be sure to poke you when we get closer to the sale! I’ll definitely do a more in-depth blog post on how it works (because I was totally mystified when I first started checking it out), but the long and short is you can pop in and just look, so it’s totally no pressure! Scored this awesome 70s-ish skirt (for less than $35, it was on big time sale!) and can’t wait to rock it all summer!